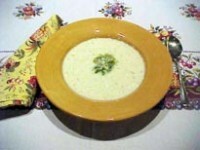 This soup is so easy and delicious — a great way to serve fresh corn. 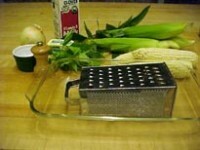 When you scrape the corn from the cob on a box grater, you don’t have to puree the soup, it’s all done. 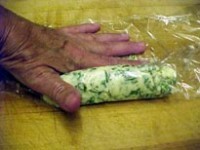 Any excess basil butter can be rolled into a log, wrapped in plastic, and stored in the fridge for up to two weeks, or the freezer for up to 6 months. Husk the corn, discarding the husks. With a sharp knife remove the outer kernels from each ear of corn. With the back of the knife, remove any juices remaining on the cob. 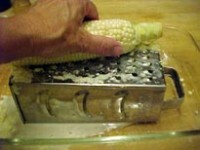 An alternative way to remove the corn and juices from the cob is to run it over a box grater in a glass baking dish. 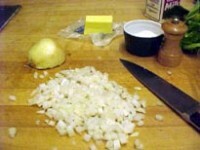 Place the onion and the butter in a medium large heavy saucepan, add a sprinkling of salt, and place over medium high heat. Cook, stirring occasionally until the onions are soft. Add the corn and the milk from the cob with the milk. Cook over medium heat for 2 to 3 minutes. Add salt and pepper to taste. 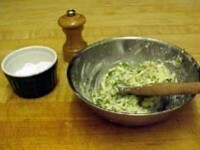 Serve the soup in warm soup bowls with a teaspoon of the basil butter in the middle.